At last, all the Potomac River Seagrass samples have had their DNA extracted via MoBio Powersoil kits (reagents, tubes, and pipettes, oh my!). All the samples showed promising amounts of DNA going into PCR. Unfortunately, after doing the first 12 samples and finding only 4 that amplified, I’m a little discouraged. I still have the rest of the ~60 samples to go through, so hopefully there will be enough bacterial DNA to amplify in the rest of the samples to do some meaningful analyses. I suspect most of the DNA extracted was non-bacterial though, so it might be hard getting sequences from these plants. -Attend UC Berkeley Symposium? Open to any level knowledge, can also present. Hannah: Blogged about the five plants (“Biogeography 2.0”). Has cut up and taken pictures of mostly-whole roots through the ice. Planning to give to John for sequencing. Other 9 plants are frozen in plastic bags, might give to Alana to stain. Alana: Reagents mixed up. Might stain bits of roots and leaves from Hannah. Planning to stain today, Monday, and Tuesday. Ruth: Plate streaking gave 14 (hopefully different) microbes. Need to make two more media (didn’t have lactate at time of first round of media-making). Thinking about whether to sequence directly/Sanger to see what the 14 microbes are. Need to ask David and Jenna about techniques on breaking open Winogradsky columns. Bri: Redo PCR c/b neg control came out positive. No change in protocol. Laura: Been emailing Laura Parfrey in British Columbia about primers for eukaryotes. Parfrey hasn’t decided on primers yet and wants to talk to someone about sampling physically. Parfrey needs to get in contact with Jenna. Alex: Been working with Space microbes, so no progress on seagrass. So, as of right now, 4 out of 12 samples worked. Qubit readings are okay, but getting a lot of non-bacterial DNA. Haven’t done PNA blockers yet. Samples have been sitting long enough that Zymo buffer turned green. Cassie: Found out that you NEED BLAST for taxonomy assignment in Qiime, which is well known to mycologists. Not a lot of papers use QIIME to begin with. Yet another example of needed to put the workflows online. Cassie found out when writing blog on how bad ITS was and found a tutorial on the topic in the process. Coordinated with UC Berkeley’s Sydney Glassman, got a copy of her detailed methods section of her recent paper and was very helpful. Sydney is also planning to write microbe.net post on ITS. Cassie will also talk to Hawaii researcher on coral fungi symbiosis. Most of Cassie’s problems seem to be solved for now! It’s bigger, it’s better, it’s Biogeography 2! About a year ago I started an Intra-plant biogeography project. Limited in scope, this project’s primary aim was to determine how much variation there was in the microbial communities across a single plant in “high resolution.” The goal was to determine whether it mattered where our ZEN collaborators cut their samples from along the roots and leaves. The general project was this: Cut a plant into about 50 strategically chosen pieces and look at the community variation across the surface. We got some really interesting results which I presented in a poster at the 2014 Lake Arrowhead Microbial Genomics Conference. One thing that always bothered me about these results were that they were for only one plant. I didn’t know if the cool patterns I was seeing were normal or a fluke. That’s where Biogeography 2 comes in, it’s a continuation of the first project but with more replicates (five, to be precise) all collected at the same time and from the same place. In the coming weeks I’ll be processing these samples and updating you about the progress. This week I finally was able to mutilate dissect the plants and now we can begin extracting DNA from the samples. Here are some pictures of plants prior to dissection. For a plant that withstands daily tidal forces, seagrass are surprisingly delicate when taken out of water. When they dry out, they crumble so I try to section them as fast as possible to prevent drying. 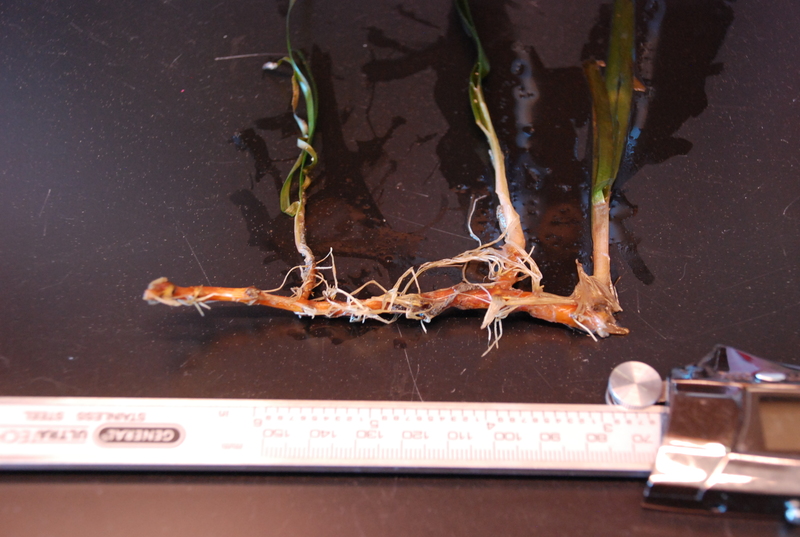 Sample preparation includes painstakingly disentangling these roots from each other and from the shoots without breaking them. (About a 2 hour process per plant). No word from the QIIME forum about my problem. So, I asked twitter for help. So far, everyone thinks it has something to do with my path, BUT 1) macqiime sets the PYTHONPATH variable, and 2) the package it’s looking for exists in both macqiime python and anaconda. OK, so it’s fixed now. There may be another way to deal with it, but what I did was install ipython notebook into the macqiime python folder, using get-pip.py to install pip, and then pip install ipython[notebook], and then comment out the line in my .bash_profile that points to the anaconda version of ipython. but, that was an unresolved issue. I did notice that the issue might actually be with lib-dynload, whatever the hell that is. something in there made it click that the path to python should be via macqiime, and you can see in the traceback that it starts off with the macqiime python, but then switches to the anaconda python. I always feel better about asking the community a question if I have some sense of what might be going on. So, I’ll post it on the QIIME forum now. ALSO, while posting it, I realized that I haven’t update to QIIME 1.9 yet. Blach. Yesterday, I installed macqiime, and today, I have just a few minutes to install IPython notebook. It says that pip should be included with Python 2.7.9 and later, and (according to the handy qiime config output from yesterday) I know that I have 2.7.3. It seems dumb to just install pip, because I’ll probably need to install lots of other things as well. I should probably upgrade to a later version of python, but in my experience, upgrading python breaks all sorts of things. However, I have nothing to lose, since this is a brand new machine, so I installed the Anaconda distribution of python. …and now pip works and I have IPython notebook! Anyway… I’m christening my new machine with QIIME. 2. I ignored AmpliconNoise because I do not use 454 data. But, I’m not sure how to fix it, so I decided to move on and come back to Topiary Explorer when/if I need it. Please note that even if you installed R and these libraries previously for MacQIIME 1.8.0, you should still upgrade to/install the latest version of R, 3.1.2, and re-install all these R packages to get everything working. Java version (if installed): Not installed. AssertionError: $PYRO_LOOKUP_FILE variable is not set. See http://qiime.org/install/install.html#ampliconnoise-install-notes for help. 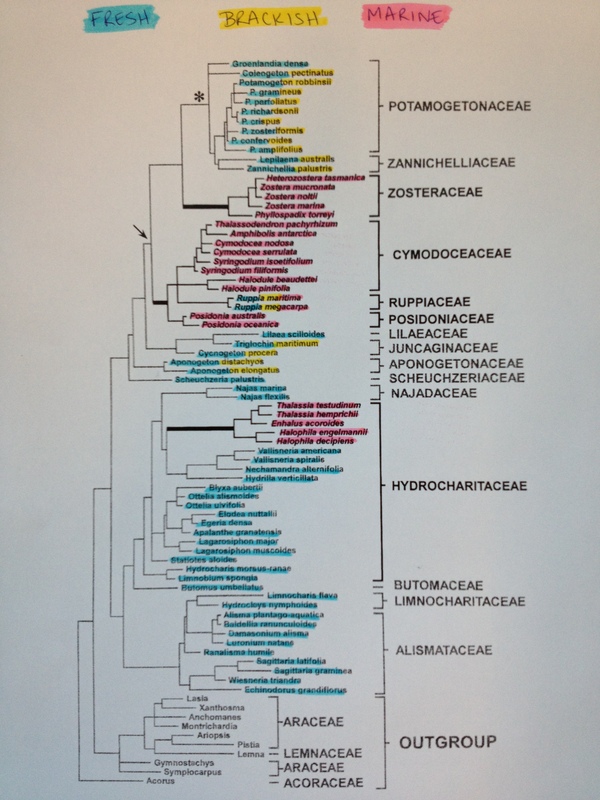 Right now, we have a lot of Zostera marina microbiome samples from around the world. So, pairing that with the ZEN data, we should have a pretty nice ecological/biogeographical story, and hopefully we will soon have a postdoc to help us address questions about community assembly with those data. 1. Make a list of target species. 2. Find out their ranges and who is likely to have access to samples. 3. Contact the person/s who might be willing to go grab a sample for me. 4. Wait (hope) for that person to get back to me. 6. Wait for the samples to be collected and returned to me. The problem is that doing this for all of the target species could take forever. I have control over 1-3, but absolutely none over 4-6. In the past, I’ve had success taking epic road trips and meeting researchers along the way who were willing to help me collect local species. So, I’m thinking that an approach like that might work here. Here’s a list of the taxa of which I’d like to have representatives, and a tree of them below. I’ll start compiling range and contact information. The Seagrass Microbiome Project is looking for a Postdoc! 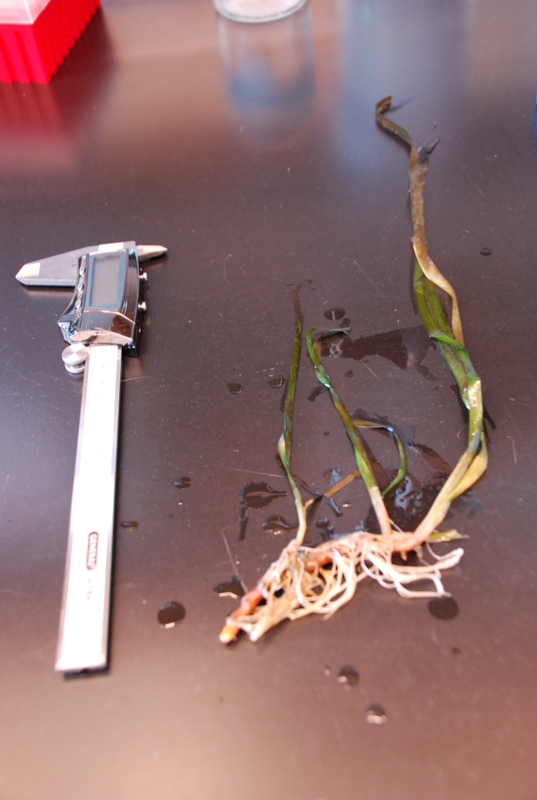 Jessica Green at the University of Oregon (http://pages.uoregon.edu/green/) is currently seeking a postdoctoral researcher to collaborate on the Seagrass Microbiome Project (http://seagrassmicrobiome.org). Applicants should have a Ph.D. in a biological, computational, mathematical, or statistical field and strong writing skills. The ideal candidate will have experience developing and applying models to understand the ecology, evolution, and/or function of complex systems. Experience in the analysis of environmental sequence data is highly desirable, but not required. The successful candidate will have the opportunity to creatively and independently tackle one or more of the science questions outlined in the Seagrass Microbiome Project grant proposal (https://seagrassmicrobiome.org/2014-grant-proposal/), funded by the Gordon and Betty Moore Foundation. The successful candidate will interact regularly with team members Jonathan Eisen (http://phylogenomics.wordpress.com), Jay Stachowicz http://www-eve.ucdavis.edu/stachowicz/stachowicz.shtml, and Jenna Lang (http://jennomics.com/) at the University of California, Davis through weekly tele-conferencing and also through regular visits to the UC Davis campus. At the University of Oregon, the candidate will benefit from ongoing microbiome research programs including the Microbial Ecology and Theory of Animals Center for Systems Biology (http://meta.uoregon.edu/) and the Biology and Built Environment Center (http://biobe.uoregon.edu/). The position is available for 1 year with the possibility for renewal depending on performance. The start date is flexible. Please email questions regarding the position to Jessica Green (jlgreen@uoregon.edu). To ensure consideration, please submit applications by March 10, 2015, but the position will remain open until filled. Women and minorities encouraged to apply. We invite applications from qualified candidates who share our commitment to diversity. Office (541) 346-3123, Fax (541) 346-4168 · This announcement is available in alternate formats upon request. If you are a qualified applicant with a disability and need accommodation with the application process, please contact us for assistance.